Big shelves create places for displaying pot plants on the facade of this house that DANstudio has completed on the outskirts of the Vietnamese capital. 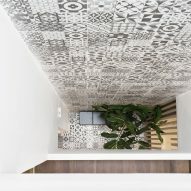 TH House was built as a part of a wider development, but Hanoi-based DANstudio was tasked with transforming it from a shell into a family home. 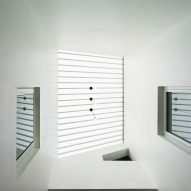 To do this, the studio came up with a design that focused on ventilation, lighting and nature. It involved cutting holes in the floors, replacing opaque walls with semi-transparent screens, and adding plants both inside and out. "The people buying this kind of house usually need to do the 'finishing' work before moving in. But the skeleton of the house causes a lot of problems, mostly related to natural ventilation and lighting," explained the architects. "So the question is, how do you finish the construction to solve all the problems coming from this skeleton?" Giving the building a new facade was one of the solutions the team came up with. They added a screen of aluminium slats, which fronts a wall of glazing and a series of balconies. This allows residents to open their living spaces up to the breeze, but shades them from the midday sun. It also offers some privacy from an adjacent railway track. To liven up this stripy wall, an assortment of exterior shelves were installed. Described by the architects as "green balconies", these shelves provide places for displaying large potted plants. Similar design features can be found inside the house. Large plants are dotted throughout the building's four storeys, while slatted wooden screens are used to create see-through partitions around both the staircase and a first-floor study. New openings in the floors help light to filter through the house. 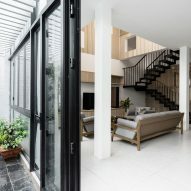 The largest of these openings transforms the ground-floor space into a double-height living room, while another creates a lightwell down to the first-floor gallery. 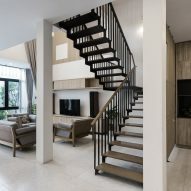 Similarly, the staircase is made up of just treads, rather than having risers, which allows even more light to reach down to the ground floor. "The residents have more freedom to interact physically to each other through these open spaces," said the architects. The most unusual room in the house is the first-floor study. It is made up of wooden cubes that function as either shelves or seating areas. "The residents can read books, work, sleep, play as a group or watch movies together on different gestures.," added the architects. "The platform and the shelf not only can store things but also create a frame for people to do unlimited activities in their own way." 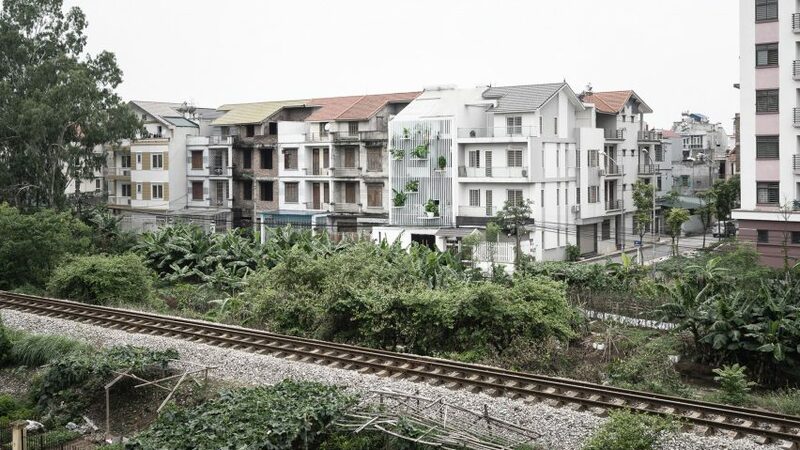 DANstudio isn't the only Vietnamese architecture studio experimenting with ways to add plants to buildings. 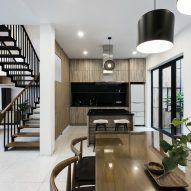 Other examples include Vo Trong Nghia Architects, which created a vertical garden on the facade of a house in Ho Chi Minh City, and Nguyen Khac Phuoc Architects, which has built a house with bamboo growing up inside it. Photography is by Quang Dam.